St. John’s Seminary’s computing resources are intended to enable the institution to carry out its responsibilities of education, research, administrative functions, and public service. Therefore, these functions have priority in using computing resources. Because SJS recognizes the value of the Internet as an essential resource for information and communication, when computing resources are available, SJS members may use them for electronic communications with colleagues and acquaintances outside SJS community, and to take advantage of information resources on the Internet, provided they abide by the policies and procedures governing such use. As stated above, when communicating via, publishing to, or downloading from, the Internet, users of SJS computing resources and systems are expected to conduct themselves in a manner that reflects well upon the Seminary. SJS members are advised to consider the public nature of information they disseminate on the Intra/Internet. In general, information in a World Wide Web site is published and available to everyone who can access the Web. SJS members must not assume that their information is restricted to only a close circle of friends, or even the campus community. SJS makes every effort to restrict external (Internet) access to internal (Intranet) information and communications, but cannot guarantee confidentiality. SJS members may not use computing resources and systems for advertising, fundraising, or other commercial activity without written authorization from the Rector. This includes, but is not limited to, linking any sort of private business to any SJS Web site. 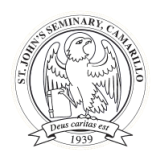 SJS members may not use the Seminary name in their Web sites in any way that implies SJS endorsement of other organizations, products or services, nor may they use SJS logos, trademarks, or seals without written authorization from the Rector. accessing computers, computer software, computer data or information, or networks without proper authorization, regardless of whether the computer, software, data, information, or network in question is owned by SJS (i.e., if you abuse the networks to which SJS belongs or the computers at other sites connected to those networks, SJS will treat this matter as an abuse of your SJS computing privileges). circumventing or attempting to circumvent normal resource limits, logon procedures, and security regulations. using computing facilities, computer accounts, or computer data for purposes other than those for which they were intended or authorized. breaking into another user's electronic mailbox, or reading someone else’s electronic mail without his or her permission (except under circumstances and by appropriate SJS administrators as specified by this policy). using SJS computing resources to harass or threaten other users including sending harassing, libelous, or slanderous e-mail (as defined by SJS codes of conduct and applicable local, state, and federal laws). taking advantage of another user's naiveté or oversights to gain access to any computer account, data, software, or file that is not your own and for which you have not received explicit authorization to access. modifying system files, system configurations, facilities, operating systems, or disk partitions of a computer unless specifically authorized to do so by an appropriate SJS administrator. damaging or vandalizing SJS computing facilities, equipment, software, or computer files. moving, removing, modifying, or changing in any way SJS computing hardware or software unless given expressed permission and authorization to do so by an appropriate SJS administrator. reading other user's data, information, files, or programs on a display screen, as printed output, or via electronic means, without the owner’s explicit permission. using SJS facilities for commercial use or profit unless specific contractual agreements have been made. using computer technology to violate policies and principles of academic honesty. distributing, downloading or displaying pornographic images or text. Users are reminded that computer-assisted plagiarism is still plagiarism, and is punishable in accordance with SJS standards for academic honesty. As an aid to a better understanding of responsible computing practices, individual departments may develop their own guidelines for responsible computing. These documents must be consistent with the “Computer Use Policy” and should be approved by the Technology Review Committee, which may recommend adjustments to the guidelines to assist departments and units with this effort.